This year, P&G’s Thank You, Mom program is spreading a message of #LoveOverBias. 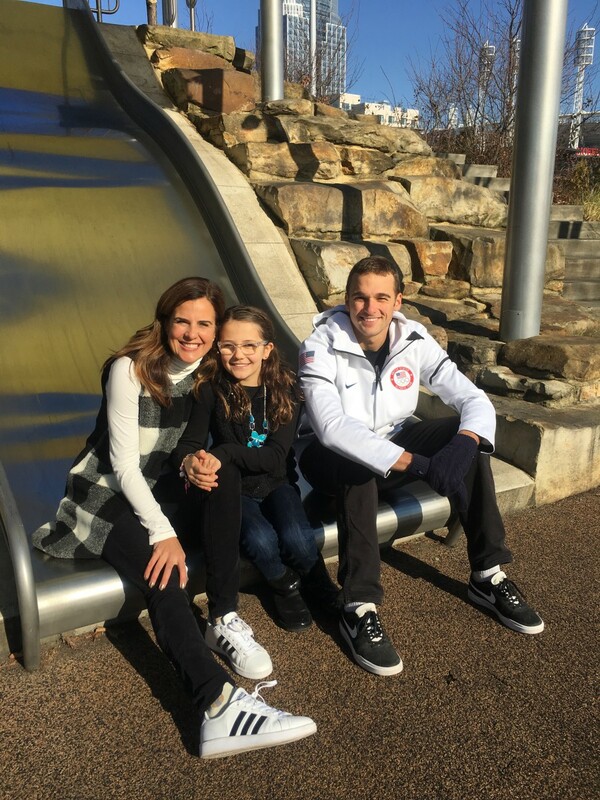 To dig into this theme, I flew to Cincinnati to meet Olympian Nick Goepper. Nick is a slopestyle skier, and bronze medalist and he&apos;s a kid (well, young man) who dreams big. Lucky for Nick, he also had a mom and dad who let him follow his passions despite any obstacles they faced. The #LoveOverBias video really got me thinking. Bias can be so many things. It&apos;s about overcoming expectations. Even for me, when I think of athletes competing at The Olympic Winter Games, I think of rich Europeans in fancy Dale sweaters. Really, bias is a lot of places. I got to talk to Nick and his mom Linda during my trip to Ohio for the Team USA Winter Fest. 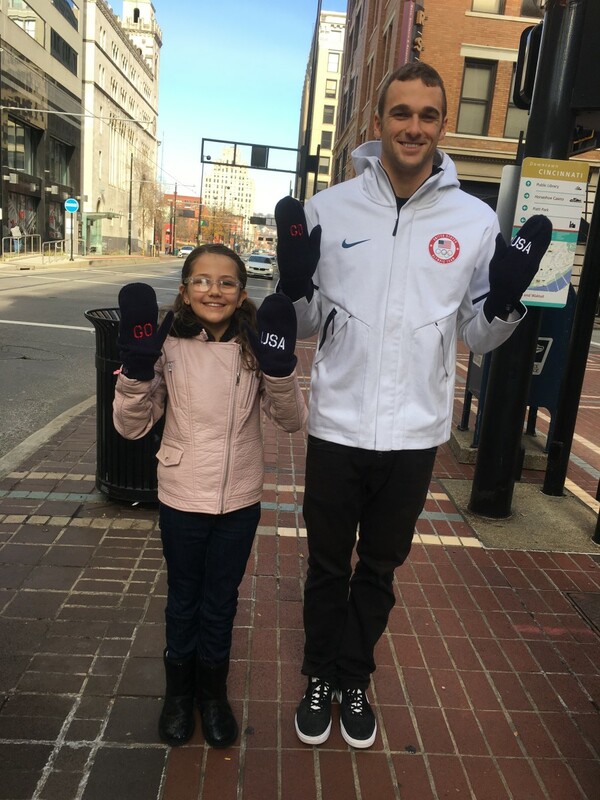 Thanks to P&G, I was able to take my little skier (my nine year old daughter) to meet Nick and help with the interview. 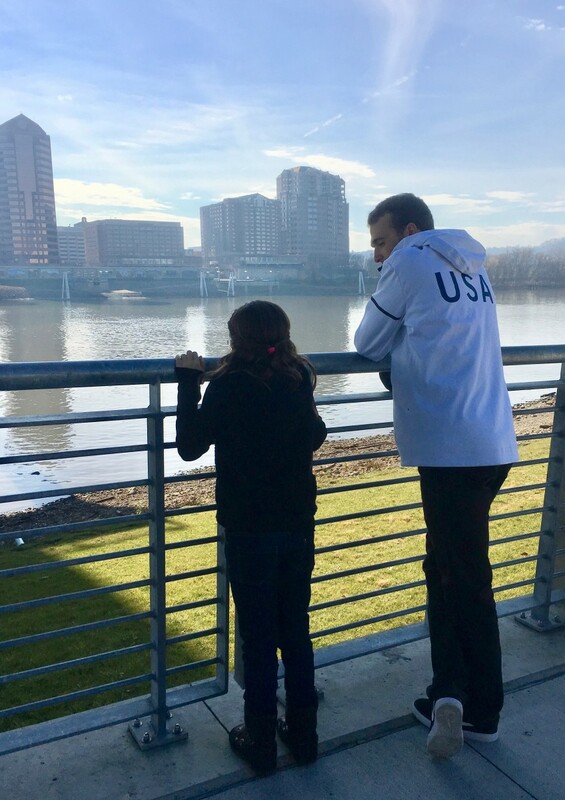 My 4th grade interviewer was ready to talk about the #LoveOverBias campaign, and even more so to learn more about what it takes to get to the Olympic Winter Games! Nick is a slopestyle skier who has faced bias as he tried to make his mark in an expensive sport that wasn’t well established. Nick’s Olympic Winter Games dreams haven’t been easy. His passion and purpose are really impressive. And it should be said, he’s really patient too! Not everyone is up for an interview by a nine-year-old girl! But Nick’s a pretty humble guy. Unlike peers who had a lot of resources at their disposal and access to splashy mountains in Utah and Colorado, Nick learned his sport in Lawrenceburg, Indiana. He started skiing at five at a small resort near his home called called Perfect North Slopes. When I asked Nick about his "home mountain," I expected him to say Park City or Vail, but Nick says, "Perfect North will always be my home mountain." Though he trains in Breckenridge and in Utah, his heart is in Indiana. He’s down to earth and values his modest roots and grounded upbringing above all else. Still, breaking into an expensive sport, professionally, certainly wasn’t without its own challenges. Nick happened upon a sport that took advantage of his athleticism, playfulness and inquisitiveness. He just kept at it, following his passion and pursuing his dream. “I wasn’t ever good at following the rules,” says Nick. Good thing slopestyle athletes can make them up as they go along. 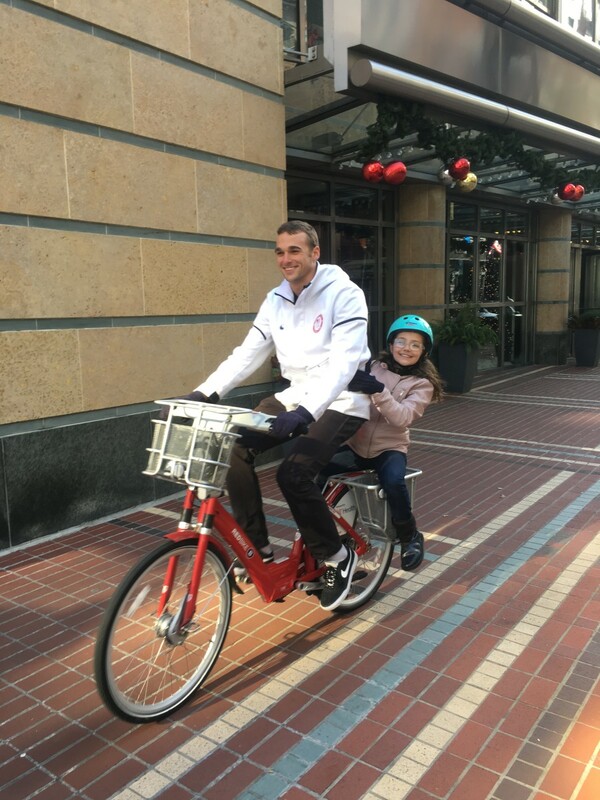 He was so kind to my daughter; not surprisingly Nick is a pretty high energy kid – he was happiest cycling and swinging with her. 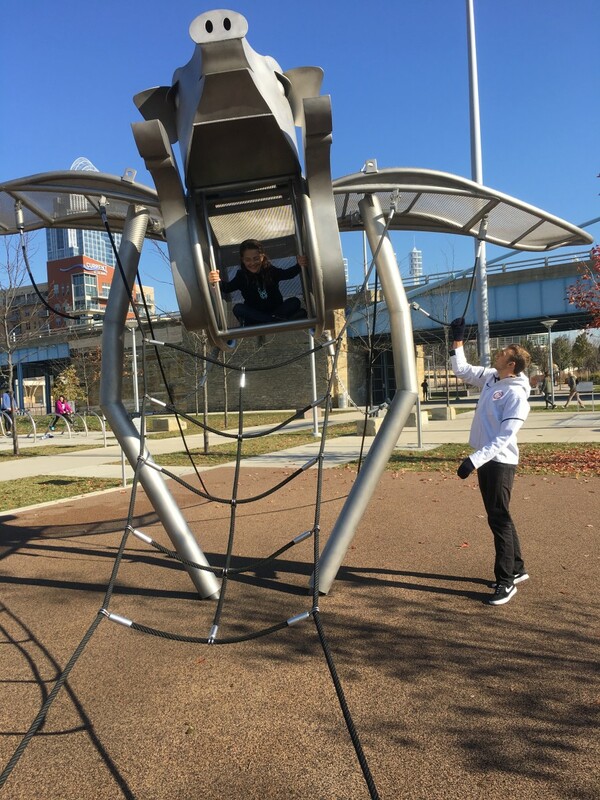 After spending a day with him, I can easily picture him being the type of kid to climb things, make skate ramps and generally have the type of kinetic energy that can drive a mom pretty nuts. My nine-year-old daughter found out that though Nick is 23, he’s really just a big kid. We learned that though he does hit the weight room, he still loves to PLAY. Cross-training can be skateboarding or surfing, and music is always a part of what he does. In fact, when he’s competing he’s listening to music. Yep, the earbud is in and the music is on when he drops onto the course. Nick says he queues up the chorus of his current favorite songs (he likes AC/DC and Deadmau5) before he starts his ski run. While Soledad and Nick had a chat, I caught up with his mom, Linda Goepper. Linda said Nick was a very “energetic kid” who loved a ton of sports. Linda did what a lot of us do with high-energy kids, she steered him towards sports to burn off some of that bounciness. They exposed him to a lot of opportunities, including soccer, swimming and skiing. Nick competed at a pretty high level in swimming, but for him, skiing became everything. Linda and her husband have four kids. She did what she could to facilitate and provide the resources required to fulfill everyone’s passions—which involved a lot of driving. We joked about the car naps that ski moms take to catch up on sleep! Linda and I also talked about raising skiers and the #LoveOverBias Campaign from P&G. Nick had to face economic hardships, but his mom strived to give him the world and help him seize opportunity. That’s all any mom really wants for her child—the uninhibited ability to foster passions and encourage goals, despite any obstacles, financial or otherwise. I know my daughter will face bias down the line—simply because she’s a girl, and as her mother and most ardent advocate, I want her to feel limitless. Since Nick’s sport was so new (it first appeared as an Olympic Event in Sochi in 2014), finding coaches, training sites and sponsors hasn’t been easy. And while a leap to professional athlete in a “new” sport isn’t easy for anyone, access to money certainly makes it a bit less challenging. Nick, however, didn’t have a trust fund or family money to help and had to overcome the challenges that came with carving his own path. Linda and her husband supported him along the way and let him live out his dreams, ultimately allowing him to leave home at 15 to train in Oregon. It’s enough of a leap of faith for a mom to let her kid try jumping on skis. This is something altogether different. Linda really inspires me! How far would you go to pursue your dreams? Would you sell candy door to door and live with a host family to chase a sport that’s brand new? That’s what Olympian Nick Goepper did in the face of challenges in order to achieve his dreams of competing in the Olympic Winter Games. And his mom couldn&apos;t be prouder! The challenges don’t stop after winning an Olympic Games bronze medal. Nick still must have his hustle on to pay for all his travel and training expenses. Would you let your child veer from the traditional path to success (you know the drill, all A’s, plus a sport, plus volunteer work, the right college then a grad school and career) to something vastly different (like catching huge air off ski jumps)? It&apos;s a conversation worth having. #Loveoverbias is a movement I believe in. Are you with me? I hope now that you know one more story of an Olympian, you&apos;ll cheer a little louder. For these Olympic Winter Games, let’s look beyond gender, the color of skin, religious beliefs, economic situations and sexual orientation. Let’s cheer for athletes for the hard work they’ve put in, what they’ve accomplished and they joy they bring us, and of course for the moms who got them there with love and sacrifice.